I just got a new cup, which means it's time to spam you all with pictures! A quick shout-out to Red Herring, who has a crapton of cups and has made detailed videos comparing the stiffness of her cups in both body and rim. She also has videos comparing one cup to all other cups in squishiness and general reviews and such. It was the first good look I've had at both sizes of the Evacup. It reassured me that the large size was more or less like other larges and not extra long to make up for the short stem. I bought the Evacup size 2. My period has become ridiculously top heavy and I don't want to have to empty my cup at work, so I figured I'd get a large. I wanted a soft V-shaped cup, since I figured that would be best for minimal pressure all around. I did try a large Fleurcup once, but I didn't really like it, though I don't know how much of that was shape, dry run, or the stem which was hanging out of me. I did eye a couple other cups, but the possibility of not having to trim a stem was very attractive to me. I'm lazy like that. Green is my favorite color, so I got Meadow. It's actually a cooler shade of green than in official pictures, but considering that it ended up warm in my own pictures, I can't blame marketing too much. 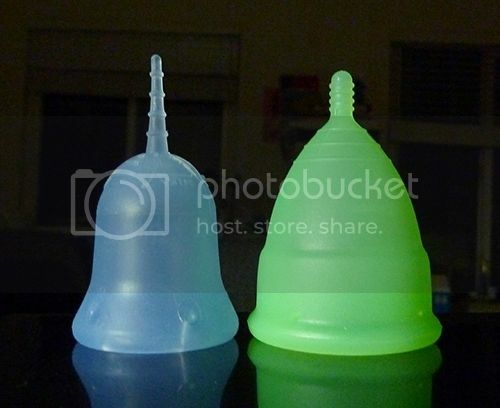 It's not as bad as the teal green Fleurcup or Sckooncup. It's so bright, it looks like it could glow in the dark. 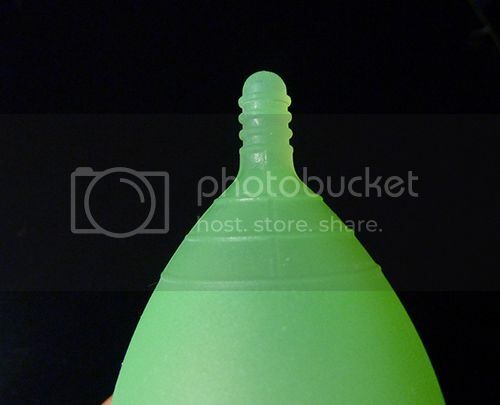 I've decided to call this shade glow-in-the-dark green, because it is that shade of green, and also a glow-in-the-dark cup would be so awesome. (Glow-in-the-dark stuff is my kryptonite.) Sadly, it doesn't actually glow in the dark. The bottom of the cup is very soft, similar to my Si-bell. The rim, which extends pretty far down, is stiffer but still pretty soft. It's got a frosted surface. (I don't think new cups go for anything else anymore. Slick-surface cups aren't very common.) 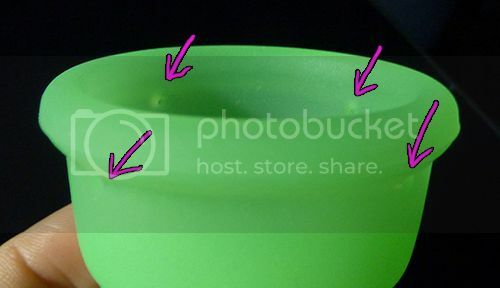 The seam is on the outside of the rim and is fairly prominent for a seam. It feels just a tiny bit smaller than the grip rings. 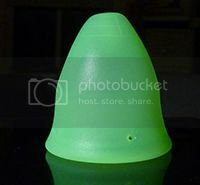 Capacity: 30ml to the holes, 35ml to the brim. The packaging I received the cup in. Minimal, which I always like. 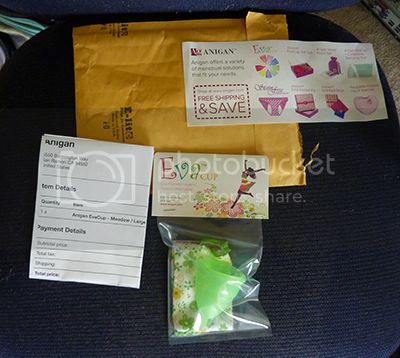 The Anigan website offers free shipping, which Amazon doesn't, so I bought it straight from them. Showing off the bag and pamphlets. It's a simple cotton bag. It's cute. Inside out. I noticed that this cup is much softer all around when inside out. I then tried it with my other cups, and yes, this is kind of generally true of all of them. I did not realize this. You can barely see it (heck, I can barely see it unless I hold it up to the light) but the "2" is stamped under a hole inside the cup. 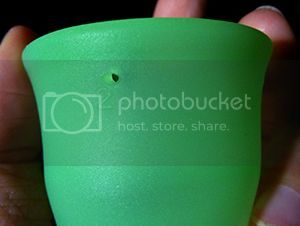 The measuring lines on the inside of the cup- 7.5 and 15 ml. I checked their accuracy with my new graduated cylinder. :D Good accuracy. They're located across the cup from the "2." Close-up of the stem and grip rings. The grip rings on the cup are barely there. I don't expect them to be super useful. The vertical lines line up with the holes. There is pretty much no space between the stem and cup, so if you trim the stem, BE CAREFUL. The stem is round and solid. It's decently squishy but not very flexible. It's easy to grip, anyway. Four holes. I think early reports said that they had only two holes, and I've seen reviews that say as such, so I guess they changed their minds somewhere along the way. They're also a bit strange in that they're slightly conical- larger on the outside than on the inside. Here you can see just how short the cup is, next to a small Sckoon. It's actually just the perfect length for me. No trimming or fishing needed. Rim comparison with the small Si-bell. Ugh, I just noticed that the rims are not totally lined up. Darn it. It was hard enough to take; I kept dropping them. 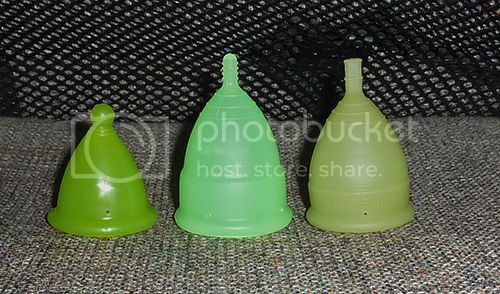 All my green cups! The coolness of the Evacup stands out a lot more next to my other green cups, which are in shades of green that I am absolutely in love with. This picture is strangely unflattering to my Lunette Diana. Lastly, a group photo, lined in order of acquisition. All are small except for the Evacup. The first four are discontinued designs. Originally, I wasn't going to bother with a dry run, but then I couldn't help myself. Probably a good thing. With this cup, I encountered something I've never encountered before with my other cups: it wouldn't open for me. I've never had trouble popping a cup open before (Si-bell is closest, but the problem wasn't popping open, it was filling with air). I actually tried folds I never bothered with before! I got the best results with a punchdown facing sideways. Apparently, the trick, for me, is to press the walls on the side rather than the back like I'm used to doing. No, I don't need advice, I totally got it, I just wanted to mention it because wow, now I understand those complaints about not being able to unfold. It probably doesn't help that this cup exhibits slight TPE-ish behavior. When I squish it and hold it for a bit, it doesn't spring back into a perfect circle like all my other silicone cups. I don't have it anymore, so I can't say for certain, but I don't think my large fleurcup did that either. I guess it's just whatever formulation of silicone they used. Not a big deal. At least I'll know for certain it'll be comfortable on my heavy days. If that is not everything you ever wanted to know about the Evacup, ask me! I've got a while before I actually get to use it. Avengers 2 will be out before then! (AVENGERS!) Pictures, questions- go ahead! Mods, can we can get an Evacup tag? I feel a bit silly tagging every cup except the main subject of the post. Thanks! Tag added :) There's no need to tag every cup mentioned, just the main one is fine. They're all being compared, even if the focus is only one cup. I know I like to see every picture of a cup compared to as many other cups as possible when I'm researching one, so I try to make sure others can find it easily too if they are as neurotic as I am. Awesome review! I love that color green. Thanks for sharing!! You're welcome! There aren't as many sharing/picture posts as there used to be, so whenever I get a new cup I like to give people a break from all the "help me!" posts. I really appreciate the picture posts! How does the Eva compare to Skoon with actual use? I've been really happy with my Skoon, but now my young pre-teen daughter is contemplating a cup - we were thinking of trying two to see what she likes best, but after watching the video, it sounds like Skoon and Eva might be similar softness wise, although from your pictures it is clear the shape is quite different... wondering if it would be better to start with two cups of different firmness, or if these medium firmness cups in differing shapes is enough to give her a good idea of what works well for her... any suggestions? Well, I'd be comparing a large Evacup to a small Sckoon, so they're not quite in the same league. I did find the small Sckoon a bit frustrating because I'd grab the end of the untrimmed stem out of habit, and that's a really bad part of the stem to grab, even if I don't need it. Evacup's stem is way easier to grip, but in a small it would be much shorter. I wouldn't call either of these cups medium softness. They're both on the very soft end of the spectrum. Well, my Sckoon isn't, but my understanding is that it's supposed to be very soft. Medium stiffness is more like a small Lunette or small Fleurcup. Shape preference is hard to determine without actually using, so yes, these cups would be good for experimenting with shape. Meluna is another good cup to consider. I think something with a long-ish stem is best in case she ends up needing a long cup. Great pics, thanks for posting! There haven't been a lot of comparison pics of the Eva and I've been curious. OMG, no! That's hilarous! A glow-in-the-dark cup will never not be funny to me. Seriously, if any company seriously came out with one, I'd buy it sight unseen even if it's longer than the Lily cup.